on the first day of practice. 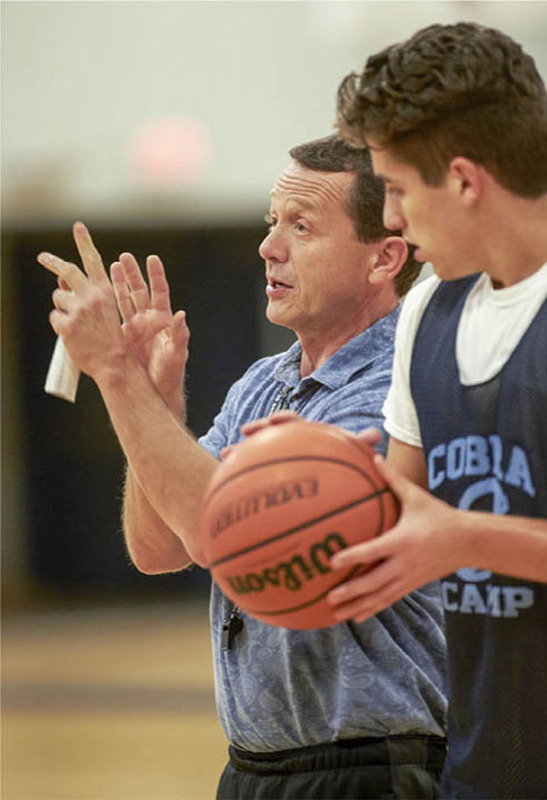 If you follow Central New York high school basketball—and maybe even if you don’t—you have probably heard of Coach Bob McKenney. In the past 19 years, McKenney led one of the area’s largest public school districts to five state championships and won more than 500 games. Many of his player stand-outs have gone on to play for their hometown college, Syracuse University. In the spring of 2015, McKenney experienced some difficult times in both his personal and professional lives. Just prior to that, he had taken a part-time physical education teaching job at Bishop Grimes Junior/Senior High School. He received a warm welcome at Grimes, where his daughter Becky also works. That healing presence, he said, carried him through the rough spring. More important to him than the professional opportunity at Grimes was the support of his three daughters—Mandy, 30; Becky, 27; and Madison, 11. “Honestly…I don’t know what I would have done without them. God puts people in place, I think, to help you get through those tough times,” he said. There were also circumstances at play that the former college basketball player could not have predicted. His part-time physical education job became full-time just after the first of the year. Soon after, the departure of Grimes’ high school basketball coach created an opening in the athletic department. At that time, McKenney confessed, he was emotionally drained and unsure if he wanted to continue coaching. Ultimately, he decided to apply for that position. “I wouldn’t have done it,” he said, “if I didn’t think I could get myself back to the right mindset to do it.” His hiring in May 2015 as the new basketball coach encouraged him.” It’s kind of renewed a little of the fire,” he admitted with a grin. There is no question that the Canton, New York, native will be teaching and coaching in a different environment at Bishop Grimes than he did at his former school. One is a much larger public school; Grimes is smaller and private. The two schools compete in different state athletic divisions. McKenney is optimistic about the coming season, though, and along with members of his former staff who were also hired at Grimes, he plans to build a strong team. Christy Perry is a freelance writer in Syracuse, New York. She recently published her first historical novel, Panther Mountain: Caroline’s Story.